Elan Felicita Creek Apartment Homes for rent in Escondido, CA is located in what is known as the Hidden Valley. The breathtaking community blends small-town friendliness with big-city excitement and thrills. The community is minutes from the rich history, culture centers, and world-class performances, as well as other internationally-renowned artist attractions. Whether you want to play a challenging round of golf, hike in scenic preserves, or bike down ranch or pine-covered mountains. Your possibilities are endless! The gated community has newly remodeled one and two bedrooms with fully equipped kitchens, featuring vaulted ceilings, beautiful crown molding, arched windows, extensive private balconies and patios, spacious walk-in closets, cottage blinds, and covered parking. For your enjoyment, we have a hi-tech fitness center, sparkling pool and relaxing spa, on-site laundry facility, and friendly on-site Staff with full-time Maintenance to meet all your maintenance needs. 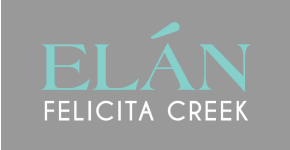 Elan Felicita Creek welcomes cats and dogs; please see our pet policy as some restrictions may apply. We are conveniently located east of Interstate 15 and minutes from Highway 78. Enjoy major retail shopping and dining at the Westfield North County Fair, which offers three stories of big-name retailers, visit the San Diego Zoo Safari Park, Escondido History Center at Grape Day Park, Stone Brewery, and World Bistro & Gardens, or explore a wide variety of restaurants and Four Diamond Hotel Casinos. Come and experience quality living at Elan Felicita Creek. You may never want to leave home!